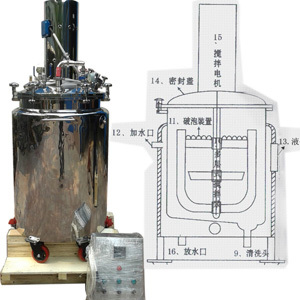 This equipment is used in small scale softgel production and laboratory production, it is used for gelatin melting and supplying. The material inside the thermal insulation layer is polyurethane foam, so it has a strong heat-insulating property; And there is a fast bubble breaking device (which is our patent product) installed on the stirring paddle, this device can help to break the bubble generated during gelatin metlting and stirring process fast, so that the vacuumizing time can be reduced and the production efficiency can be improved; There are universal wheels installed on the bottom of the bucket, so it can be moved flexibly. In conclusion, our gelatin melting bucket is in accordance with GMP standards.